Blue Sky Filters, Inc. has been in business since 1975 with a strong focus on recycling and environmentally friendly products and services. Originally setting out to not only clean filters, but to develop a process to recycle and re-use filters. In 1998, we made the decision to improve and establish a company that not only operated within the Federal and Local Clean Air and Water Acts, but also to protect our customers and employees from generated waste and landfill pollution exposure. While hundreds of other filter cleaners around the country are discharging directly “down the drain” and not meeting local, state and federal compliances, we feel this practice is wrong and irresponsible. We feel we need to conduct our business within proper legal and ethical guidelines and it is the “right thing” to do! You and our nation have spent billions of dollars on clean air and water controls and we want to be a good steward of our environment and protect it for future generations. Our efforts towards environmental friendliness include, on-site water reclamation, filter cleaning and filter recycling, to name a few. Not all filter services are the same. Please compare and make your decision to use a filter cleaning service based on your needs, not just price! Since the passage of the Clean Air Act and The Clean Water Act, the terms “Cradle to Grave”, “Potentially Responsible Party“, and “Originator” have been used to place responsibility on the original generator (you) and contractors handling the generator’s waster (filter service). The courts place final responsibility on the generator for any contaminated waste (baghouse, dust, waste or fumes) and subsequent wastes created from those wastes. Tis includes wastes improperly handled and created by your filter service. Ultimately, the liability and responsibility falls on the original generator (You). Please contact your environmental officer or consultant to discuss your exposure when using a non-compliant filter service. •We will advise you if cleaning is not cost effective, and will recommend replacement rather than cleaning. •You are not charged for filters that are unusable. Cleaned bag is individually inspected for holes, seam wear & condition and measured for proper size. Cleaned bags are randomly checked in each order for permeability (air flow) and a report maintained with each order. Bags found not within the guidelines of new material will trigger additional bag testing and sorting. Reusable crates are available upon request- also, our boxes are perfect for re-use to return dirty bags. Designs are made on the bags for future reference. Snap band replacements, shortening, lengthening or modifications are available. Containment. Dirty bags and cartridges are handled in closed, reusable crates or totes, or picked up by our contained truck. UPS and common carriers have shipping restrictions on loose or dirty shipments containing dusts or hazardous materials. No cross-contamination. Our facility is designed to clean dust collection filters, not truck filters, or clothes, linens and towels used for human use. 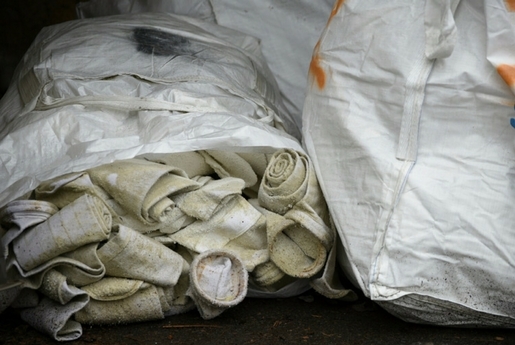 Local clothing and linen laundries should not be cleaning contaminated dust collection bags! Please also be aware that all food use filters are processed separately in our facility. Continuous monitoring and control of our water waste. 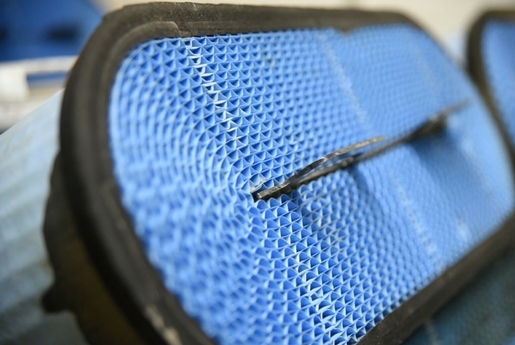 Over $200,00 has been spent in three years to develop a treatment system capable of removing the varied dusts and contaminants from your filters. The Local & Federal Clean Water Act requires all wash type facilities to meet strict discharge standards, and in 2001-2002 those standards became even more restrictive. Disposal of sludge waste created from filter cleaning. The dusts and sludge created is combined, treated and pH balanced in such a way as to make it desirable for mixing with wood wastes and grass clippings to make a very high quality land cover- not landfill! Filter bag and element disposal. Rejected filters are cleaned prior to landfill disposal or returned to the customer upon request, becoming the customer’s responsibility to dispose of as they see fit. *We are presently working with a waste to energy company to use the cleaned filters as a source of fuel for generating energy. Recycled water. Our focus is on reuse of our wash and runoff waters. All of our lot wash down, rain water and plant clean-up waters are being treated and we are helping with water conservation by re-using much of our water. Employee exposure. All employees associated with handling dust and wastes have been instructed in proper handling procedures, tested in respirator fit and use, and required to attend company sponsored internal safety meetings. Line item invoicing. A small fee is charged and shown on your invoice showing that we have handled your filter waste within approved guidelines. The fee does not cover the costs, but it is our statement of commitment to you and indicates our responsibility for this waste.